A useful and effective weeding tool perfect for weeding paving, patios, garden use etc. Telescopic design allow user to stand instead of being on hands and knees. Simple twist lock action to extent and retract. Length adjustable from 27" (693mm) to 37" (940mm). Fitted with double stainless steel blade. High visibility yellow makes it easy to find. 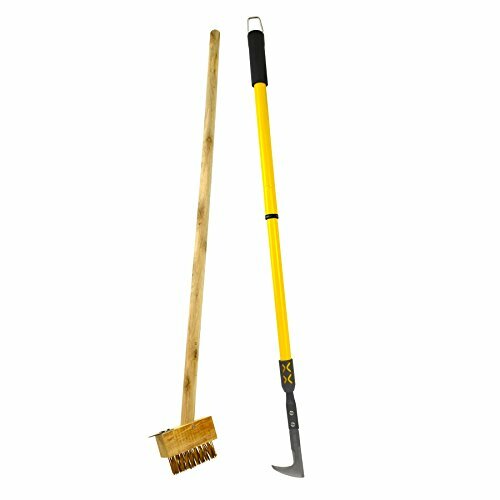 Extra long brush makes it easy to weed patios. The long handle means you can work whilst standing instead of on your hands and knees. The handle is long enough that you don't even have to bend to use it. Wooden construction, 90cm (36") total length including bristles. Head size approx. 10cm (4") by 3.5cm (13/8").